Ethics in leadership- what is your walk? Ethics. Simple word. Much involved in it. The last two weeks have had me in a leadership role overseeing actions, communication and ethical practices for people I have responsibility for. One piece of wisdom and insight for all leaders to remember: we, when given a role of leadership, we serve others best when we remember first and foremost that it is us who must guide ourselves with each step, thought and action in order to help raise up others in every situation. What we do in every situation- whether you wear the role of ‘leader’ or follower’ is felt and observed by others. They may not comment. They may not question. They DO observe and they do change their actions and thinking towards you. Manage your own efforts and actions first, live ethically and morally. When you do, you will be able to guide others for betterment as they see you are consistent through and through. Do you walk with the level of ethics and integrity that you could? Do you walk with the level of ethics and integrity that you should? For women who are just recently pregnant, or people who have had a change in their weight, moisturizers used on the skin may help prevent stretch marks . Though nothing is scientifically proven, anecdotal evidence supports the idea that using moisturizers fortified with vitamin A and vitamin E may help prevent stretch marks. Vitamin A and E are, after all, essential components in the epidermal (skin) maintenance system. Helping your body regulate and in some cases speed up the growth of new skin cells may help reduce the appearance and number of stretch marks when overall body volume is finally lost. Watching your weight gain during pregnancy, weight lifting or simply for great health, along with massaging your skin on a regular basis will help prevent and improve the appearance of stretch marks. It should be obvious to most of us that watching what one eats should be a priority in such a health conscious society as we live in. Regulating your weight and overall body volume will reduce the chance of stretch marks. Massaging the skin improves capillary circulation, and promotes new tissue growth. So, pass on that chocolate lava cake and tell your husband or wife that full-body massage promised to you is long overdue. After a change in weight or body mass, if you find you do have stretch marks, here is an amazing product that was originally formulated to help skin cancer patients grow new, healthy, undamaged skin. I recently started using this revolutionary product on myself for stretch marks, scars and other skin blemishes I’ve had for years. I am very thrilled to share with you an easy, safe and amazingly effective way to not only reduce these visual skin marks, but also it is safe for everyday use on your face too! It has three patents on the product and has shown to produce incredible healthy skin for many types of skin types. Two of the main ingredients are Vitamin E and Grape Seed Oil. These have been shown to may help increase the strength and elasticity of the collagen within your skin. It’s simple to use: Any where that you want to improve your skin, do your regular nightly bed time routine. all you do is roll this on each night before bed. Then, once that is done, roll on the Skincerity® Skin Repair. It will create a ‘mask’ on your skin that ‘breathes’- yet stays on you until the morning. The ‘mask’ locks in the nourishing skin regenerating ingredients. Upon waking up in the morning, simply wash off the Skincerity® mask. 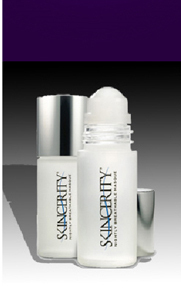 You will begin to notice healthier skin developing with each days use. Is perfection a requirement for leadership? Leaders don’t have to be perfect. In fact, great leaders make mistakes. What makes them great is their humility to admit the mistake, recognize it, and their willingness to learn from it. It’s not about how often you fall- it’s about what you do when you fall, and how quickly you get back up to walk again.